The hard-rocking dance-punk duo of Sebastien Grainger and Jesse F. Keeler come alive on their first album in a decade. Two songs into Death From Above 1979's new album The Physical World, singer and drummer Sebastien Granger sums up the band's first album in a decade quite nicely. "It's the same old song, just a different tune," he repeats on the propulsive "Right On, Frankenstein!," an appropriate line for an album which follows in the sonic footsteps of the band's muscular, rip-roaring 2004 debut You're a Woman, I'm a Machine. It may have taken 10 years and a prolonged separation for the Toronto twosome to make their return, but The Physical World has all of the muscular riffs and dance-punk force fans loved in the mid-2000s. Grainger and bassist Jesse F. Keeler provide a ferocity and reckless abandon that comes close to matching their debut throughout The Physical World's 35 minutes, highlighted by the excellent "Trainwreck 1979." 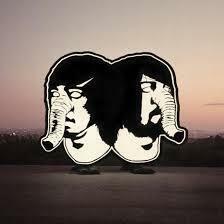 Listeners may have had to wait a decade, but Death From Above 1979 certainly comes alive on The Physical World.